We'd love to see you at the InMotion Matariki Parade, in the Wynyard Quarter (Auckland), on Saturday 6th July 2019. But first you need to decorate your waka; whether it be a bike or a wheelchair. Our friends at Lucid DreamBike are the experts in decorating bikes (and wheelchairs) and we asked them to share a few tips. Here are a few inspiring ideas for creating a lantern to decorate your wheels. Meet Kelvin, our good friend from Lucid DreamBike. We love riding bikes at night! It's joyous, fun and the key to a surreal parallel city where anything is possible. You too can turn your own bike or wheelchair into a Lucid DreamBike: a magical waka that allows you to explore the city. We've experimented with different ways of doing this. It can be as simple as wrapping a string of LED fairy lights around your bike or wheelchair frame to the very elaborate. How far you want to go is up to you !!! most have built in flashing and pulsing functions so your lantern can flash and pulse too! And always .... make sure that it is safe to ride still! go to your local recycling centre or Op shop first and see what you can find. You can sometimes find paper lanterns and that is great because you don't need to buy new ones and they get another life . Experiment with different materials such as cardboard boxes, paper coffee cups, balloons, plastic flowers and foliage. decking your bike out with flowers and green leaves and weaving a few fairy lights through them. It's really up to you what you do. The trick is to make something that is fun for you that you can ride with safely and with style. if you use battery LED fairy lights think about creating tiny paper lanterns for each light and stringing them above your bike from bamboo. bamboo is a great material for this, you can create rigid or bendy structures to hang lights from and cut up old tyre inner tubes into strips and lash bamboo sticks onto your bike to hang lanterns. Also think about bendy irrigation hose to create a loop over your handlebars to hang a lantern from. try fixing different bells on your handle bars to bring some sound into your creation. There are tonnes of great ideas out there - have a look on the internet for inspiration, put aside a day in the weekend and see what you can come up with. The team from Lucid DreamBike show us how to make a lantern for your wheelchair or bike, in preparation for the InMotion Matariki parade 2018! Lucid DreamBike are a group of friends who have been working in recent years creating beautiful collaborative bike spectaculars in our home town of Wellington and around the country. 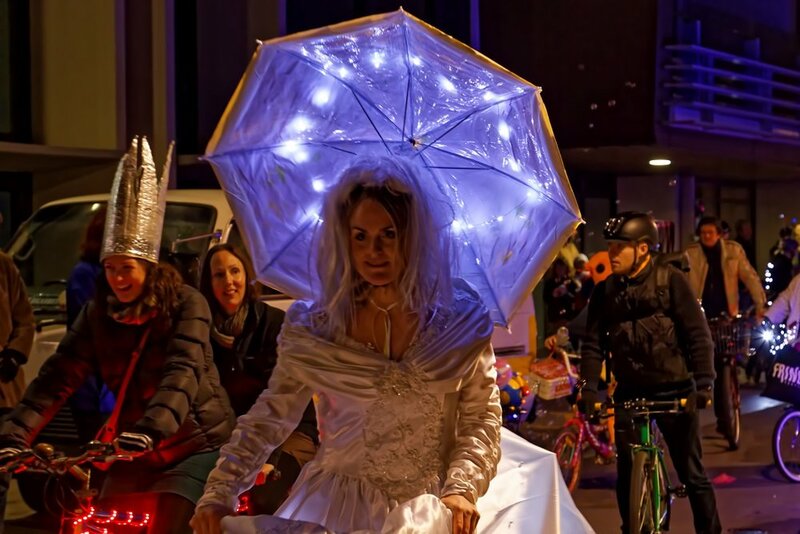 In the summer of 2016 we created our first magical night bicycle ride filled with performance and art spread around some secret unexplored parts of Wellington, lighting up the bikes of participants and the streets of the city. We had so much fun that we have continued doing this and coming up with new ideas on how to use the bicycle, art, music and performance to create a magical version of the city for all who want to enter it. See Lucid DreamBike and their great big magical decorated waka at the InMotion Matariki parade!